Before we leave the story of Joseph naming his sons, I want to share one more personal example. If this seems a little self-indulgent, I apologize. But I do believe that part of what I’m supposed to do in these devotions is share my own life of faith with you, even as my focus is upon God’s Word as it shapes our prayers. Last Friday, I told you the story of the naming of my son, Nathan. His name, which in Hebrew means “he has given,” represents God’s grace given to my wife and me after a long season of infertility. When Nathan was about a year old, Linda and I began to think about having another child. Given how long it had taken for us to get pregnant with Nathan and how much medical help we required, we assumed that it might be several years before we had a second child, if we were able to do so at all. Yet one day, shortly before we had an appointment with our doctor, Linda announced to me that her pregnancy test came back positive. You might imagine that we were overcome with gladness. But, in fact, given our previous history, we were tentative. Surely something must have gone wrong with the test. So, we went promptly to our doctor for a more accurate test. Sure enough, his report was positive. Linda was pregnant. 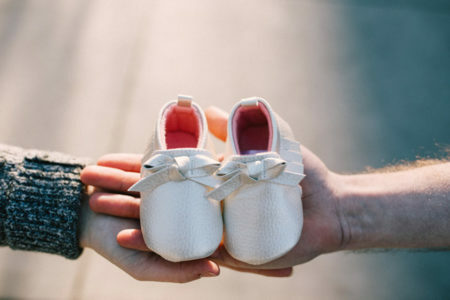 When it finally sunk in that we were going to have another child, and that we did not have to go through the ordeal of infertility treatments, Linda and I were filled with joy. We just couldn’t believe how richly God had blessed us. This was a season of great rejoicing in the Roberts household. When Linda and I learned that we were going to have a girl, I suggested that we name her “Kara.” This name is the English equivalent of the Greek word that means “joy.” Given the greatness of our joy, it seemed only right to represent this joy in the name of our baby. So, when she was born, we called her Kara. The funny thing is, we could have named Kara “Ephraim.” Her existence was indeed a testimony to the fact that God had made Linda and me fruitful—the meaning of “Ephraim”—even in the misfortune of our infertility. I don’t think, however, that Kara would have enjoyed being called Ephraim. She loves the name “Kara,” however. Plus, I can’t think of a better name for my daughter than “Kara.” I don’t think there is any magic in naming, but it was the strangest thing to watch Kara grow up and see her become one of the most joyful people I have ever known. When Kara got excited about something, which was pretty much all the time, she would tremble with excitement, her smile almost cracking her face. She could hardly contain her joy. In a family of fairly reserved people, Kara was the glaring, glorious, grace-filled exception. She still is, by the way. I explained last Friday that I don’t always think “gift of God” when I say Nathan’s name. Nor do I always associate Kara’s name with joy. But there are times when I sit back and marvel at how God’s grace has been showered upon me through the gift of Kara, my joyful daughter. Thanks be to God for his amazing grace! As you think about your life, when have you been richly blessed by God’s grace? What reminds you of these times of blessing? What keeps God’s grace regularly in your consciousness? What helps you to remember the grace of God given through Christ? Gracious God, how good you are to us. You are gracious beyond measure. You give to us both life and eternal life. You give us a reason for living and strength to live fruitfully. Thank you! Yet how easily we forget your grace. How often we take your grace for granted. Forgive us, Lord. And then help us. Remind us of your grace in our lives. May we see the tangible reminders of your grace all around us. May we pay attention, so that our hearts might be filled with gratitude and so that we might live in grateful response to your amazing grace. Amen. This post was originally published on February 9, 2016. Best of Daily Reflections: Abundant Joy! This naming phenomenon was part of my dissertation. I interviewed leaders, asked them about the names of their children and or what they would name their children if named after their life experience and had them compare the meaning of those names to their leadership. The results where very interesting. Dave Stoop was on my dissertation committee and helped me narrow down my focus. It was a very challenging and enjoyable project. Hello, Kit. Thanks for your fascinating comment. Your research sounds most interesting. Ah, Dave Stoop, a good, good man and long time friend. Blessings to you!